Last week I noticed that I had been spending so much time online, cleaning, cooking and preparing for shopping trips that I hadn’t taken dear little one out for one of our walks on quite a while. We play inside due to the cold, but sometimes you just gotta say “forget it! Lets venture out into the cold!” And thats exactly what we did. We were cold and tired after about a half an hour but he enjoyed it, and I didn’t feel like a Mother imprisoning her child. It was a win-win! 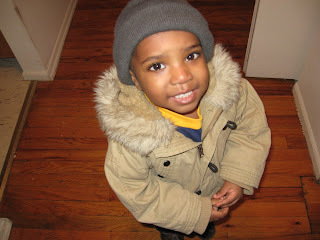 Plus, Sonny looked so cute in his big hat and puffy jacket! Adorable!